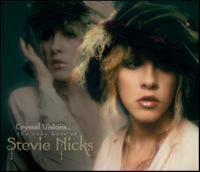 Crystal Visions : the Very Best of Stevie Nicks. Edge of seventeen -- I can't wait -- Sorcerer -- If anybody falls in love -- Stop draggin' my heart around (with Tom Petty) -- Silver Springs (with Fleetwood Mac) -- Dreams (with Deep Dish) -- Rhiannon (Live) -- Rooms on fire -- Talk to me -- Landslide (live with the Melbourne Symphony) -- Stand back -- Planets of the universe -- Rock and roll (Live) -- Leather and lace (with Don Henley) -- Edge of seventeen (live with The Melbourne Symphony). Stevie Nicks, vocals, keyboards ; with assisting musicians and vocalists. The highlights from Stevie Nicks's solo career come together for Reflections: the very best of Stevie Nicks. The collection includes such hits as Stand back; Edge of Seventeen; and Stop Draggin' My Heart Around. Description: 2 audio discs : 33 1/2 rpm ; 12 in.